I normally try to take notes about the cigars I smoke so I can know which ones are the most enjoyable. When you buy a cigar, especially in AR with the high taxes you don’t want to spend the money on something that you’ll not enjoy for the next hour or two. I did this review specifically for my friends at Southern Ash so it’s a little more polished than my typical, scribbled one-liner notes. Make sure you check out the blog at Southern Ash – they cover everything from cigars, drinks, how to dress dapperly…dapper…ummm…real nice and much more. I allowed it to stay in my humidor for about 6 weeks before smoking it, but it might’ve been better to wait a little longer. 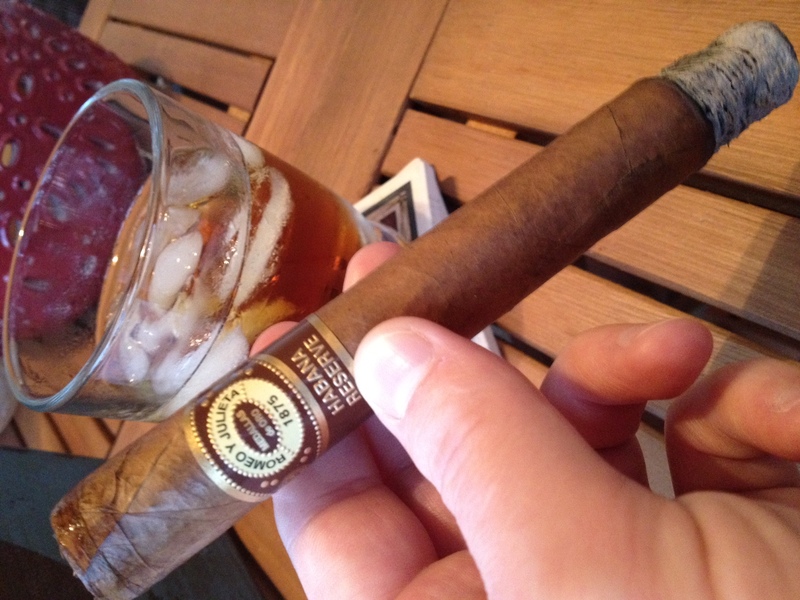 I paired the cigar with B&B on the rocks; one of my favorite drinks for a quality cigar. I had read several reviews on this cigar before I received it as a gift and was excited to try it. I think I was especially excited to try it because Romeo y Julieta’s Reserva Real is one of my all-time favorite cigars and I figured this one would be of similar exceptional taste and construction. Made in Honduras. Honduran and Nicaraguan filler with a Nicaraguan wrapper. It had a soft spongy feel, but not overly spongy, just a little give when squeezed. The weight made it look consistent for its size – 7x 54. Since it was a pretty good size I knew it would probably be a pretty good investment of time. The total smoke was about an hour and a half, but I tend to smoke my cigars a little faster than most others. The initial cold draw before I lit it was similar to fresh hay along with a little sweetness and there also seemed to be a feint hint of chocolate or caramel. Tasty. The wrapper was a little oily primarily from the dark wrapper (I prefer it when it looks a bit oily) and a good looking cigar overall. Good quality construction. The flavor of the cigar was definitely a more robust take from Romeo y Julieta. Most Romeo y Julietas I’ve had are light to medium body cigars. On the initial light it was immediately medium to full body with a light leathery taste, and then a slight peppery taste on the smooth finish. It was a very short, crisp finish – it didn’t linger long at all initially. The aroma from the smoke was very pleasant, not harsh or overwhelming. It took a little while to pinpoint the flavors – not because the cigar was complex, because it wasn’t – but just because it seemed a bit deceiving. On the initial inhale it seemed like it was going to be a nutty flavor but it kept coming right back to a clean leather taste. I had planned on breaking down the flavors by each 1/3rd through the smoke, but the flavor profile did not change much during the entire hour and a half smoke. The only variation during the smoke was that the leathery taste and peppery finish built gradually; other than that it was pretty consistent throughout. 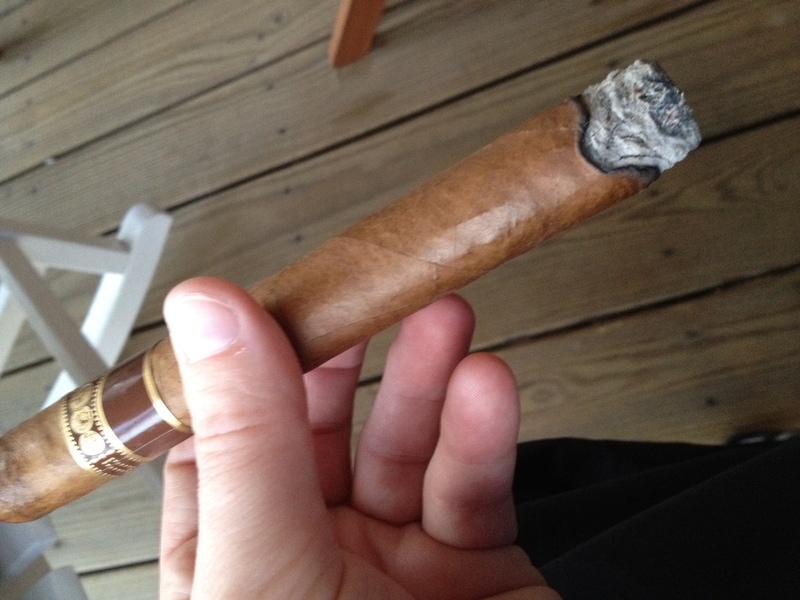 The burn during the whole cigar was very disappointing as it was very inconsistent and uneven. It would be fine and then gradually start to burn unevenly but then would always correct itself not long after. It never got so out of control that I had to touch up the burn with my lighter. But it was a bit disappointing. The ash was also an adventure – it was a very loose ash and it never got longer than about 1” inch before falling off. There was only one time where the ash made it into my ash tray because it continually fell off on it’s own, so it kept me on my toes while I was smoking it. The draw itself was almost enough to make me not buy another one of these cigars. The draw was very tight – not Cuban cigar tight but too tight for my enjoyment. I even tried to recut it to open it up a bit more but that just resulted in me knocking the initial ash off. And it stayed tight throughout the entire cigar. The drawbacks were the tight draw and the very loose ash, but I would still recommend this cigar to others. I think I seemed a bit deflated because I had higher hopes for it, but it’s still a good cigar. I think in most places you could find this for about $8 a stick which puts it a little more expensive than your everyday smokes. If you’re looking for a complex cigar this won’t be your choice, but if you’re looking for a medium to full body flavorful smoke, AND if you can find it in a value pack you won’t be disappointed. But because of the draw it wouldn’t be my first choice. What the hell is going on in the Christian community?! I have friends I “follow on twitter and facebook” who are conservatives, liberals, moderates, progressives (not a fan of this word), fundamentalists, emergents, emergings, atheists, creationists, evolutionists, and many other political and religious categories from the whole spectrum of people-groups. It seems that recently I see so much bitching and bickering at each other within the christian community over theological differences. I’m not talking about normal disagreements – that happens when you are deciding what pizza to order. I’m talking about disparaging, nasty attacks on theologies that people hold so dear. It seems as if when we hear somebody has a different viewpoint we go to our phones, laptops and social media outlets to say how wrong and how stupid they are, and sometimes if they’re really different and wear dark-rimmed glasses we’ll break out the heretic label and sit back and feel comfy in our piety. We seem so focused on proving how “my theology is right and your theology is wrong”. I just don’t get it. I mean I understand (but don’t agree necessarily) about the machismo aspect in not wanting to back down from our own beliefs; and that if I said I believe it then I have to defend myself so as not to look weak, but why do we do so at the expense of embarrassing our christian brother? If you don’t know what I’m talking about I’m referencing some of the relatively, recent comments from John Piper to Rob Bell, from creationists towards evolutionists (and vice versa), and from the litany of emergent thinkers who spit vile towards Mark Driscoll on a number of topics. So everybody……….stop……….take a breath……….and freaking relax. Cue Frankie. I am very much aware that I am as guilty of these attacks, or at the very least a similar attitude, as anyone…although I try to be an equal opportunity offender and maybe someday I can get to a point where I’m much more gracious and less offensive…although that’s also a two-way street. Maybe in time we all can learn to relax and engage in quality, respectful conversations with each other and not passive aggressively attack each other via twitter, facebook, or other electronic outlets. In other words, can we try to go out of our way not to piss each other off? Ecclesiastes 7:16 – Be not overly righteous, and do not make yourself too wise. Why should you destroy yourself? Isaiah 55:8, 9 – For my thoughts are not your thoughts, neither are your ways my ways, declares the Lord. For as the heavens are higher than the earth, so are my ways higher than your ways and my thoughts than your thoughts. Galatians 4:21 Tell me, you who want to be under the law, are you not aware of what the law says? Lamentations 3:40 Let us examine our ways and test them, and let us return to the Lord. Now, here’s the deal, over the next couple of months (I actually have no idea what the timeframe is) but I am re-dedicating myself to posting blogs on a more regular basis. I have about 10 posts that are in a final draft phase and just need a little touching up before I hit publish, and then I have about another 50 that are in the works so hopefully they’ll be up in a more consistent time-frame. Disclaimer – I am probably going to post something that crosses the conservative or liberal limits of your theology and honestly, I quite possibly could cross both edges within the same blog-post as I often oscillate between diametrically-opposed camps on different topics. I will have some posts that will be humorous, insightful, dumb, profound, and maybe completely meaningless…to you. I will have some posts that are in story form. Some of my posts will be solely about our culture (which is not divorced from being theological as some fundamentalists might think). Some posts might be political. Some might be about sports. Some might just be about a new cigar I smoked, but what I ask is no matter if the topic is theological, political, cigar-ical or whatever, that you do not automatically discount what I say just because you think you disagree with me. Maybe somewhere in the post is a nugget that can help us progress forward to quality conversations, respectful discourse, and redeeming our Earth just as God has called us to do. can be too much, obviously. It’s cliche, it’s tired, it’s trite, but it’s also true. Back to the Battalion…so I bought this Battalion in NW AR and lit it up when I was sitting at a local saloon in Little Rock as a toast to myself for a very good day in sales. Now last night very well could’ve been an anomaly; it could’ve been a combination of: I was tired from driving back from NW AR, or what I had eaten before getting to the local saloon, or even the pairing of the beer I was drinking while smoking the cigar, but last night I felt like I was trying to smoke two Rock Patel The Edge Corojos (second favorite cigar) at once. It was just too much of a good thing. So that’s all I have for now, but just wanted to pass along some thoughts on the Battalion. I’ll keep smoking it and see if my attitude on it changes…it probably will. Overall, it’s a good smoke, but I’ll spread out the goodness by just buying two The Edge Corojos and smoking them separately.